Breakin' Convention is excited to announce Open Art Surgery’s return to Sadler’s Wells’ Lilian Baylis Studio, on Friday 13 September 2013. Open Art Surgery is a showcase for new ideas in hip hop theatre, giving audiences a unique opportunity to see cutting edge work in development and give feedback directly to the artists. Performers will present work they have created in the days leading up to the event; post-show the audience is invited to join the artists to discuss the work in person. Companies featuring in the Open Art Surgery line up include: Botis Seva of Far From The Norm, one of London’s brightest emerging youth dance companies; Liara Barussi, choreographer of Jukebox Collective, creating a duet with breaking prodigy B-Boy Sunni; and solo b-boy world champion, Mouse, creating theatre work for the first time with house dancer Clara Bajado. Festival circuit regulars The Beatbox Collective - led by Marv-Ill Superlungs with some of the UK’s leading beatboxers - will experiment with the use of vocals, soundscapes and movement; B-Girl Nefeli Tsiouti will showcase new material, and locker Yami 'Rowdy' Lofvenberg, who worked on the London 2012 Olympics Opening Ceremony, will create solo work. Theatre specialist Anthony Ekundayo Lennon will mentor the artists and help develop the work in the lead up to the show, alongside veteran hip hop theatre maker Tony Thrills, who will also host the evening. Tony Thrills is a founder member of Edinburgh based B-Boy crew Random Aspekts. As a dancer he has worked with companies including Freshmess, State of Emergency, Off Kilter, and Russian physical theatre maestros, Derevo. As a choreographer he has worked with Scottish Ballet, Artlink and Dundee Contemporary Arts Centre, among others. 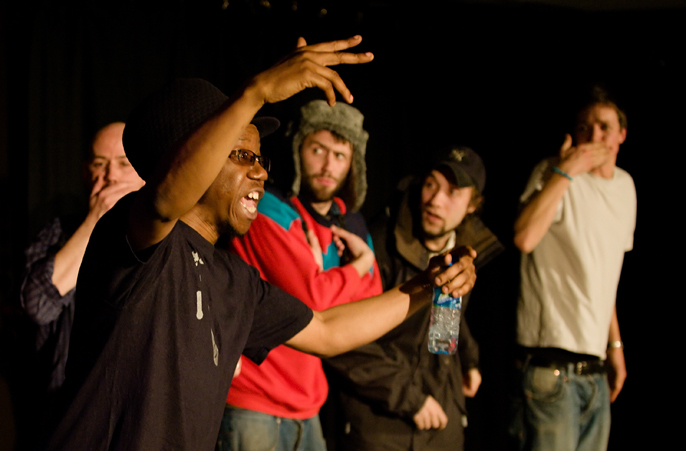 His company, Room 2 Manoeuvre, fuses hip hop styles with contemporary theatre practices. He recently completed a run of his new work, Squish, at Dancebase in Edinburgh, part of the Festival Fringe. Actor and director Anthony Ekundayo Lennon is co-lead drama practitioner at the Lyric, Hammersmith (Youth Inclusion Department) and artist-in-residence at educational consultancy Hogarth Blake. He recently co-directed Cat on a Hot Tin Roof at the Novello Theatre, and has also directed for Camden People’s Theatre, Contact Theatre (Manchester), Creative Riddim’s Community Theatre (Bristol) and the Birmingham Arts Festival.